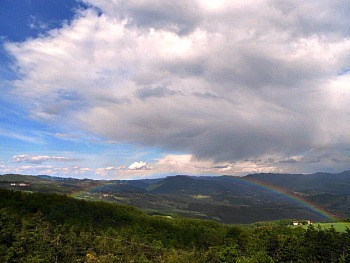 Firenzuola and its Mountains: Relatively Untamed Landscapes in the Mountains Between Bologna and Florence. The Raticosa Pass (Passo della Raticosa) is situated at 968 m above sea level, and it is meant to represent the cultural-historical (if not geographical) boundary between Tuscany and Emilia-Romagna. From an administrative point of view, the pass is located in the province of Florence, in the municipality of Firenzuola, along provincial Road no. 65, also known as “Statale della Futa” (from a geographical point of view, however, the area of the pass befalls on the northern side of the Apennines, which belongs to Emilia also culturally). This road (“Statale della Futa”), prior to the building of the A1 Motorway — “Highway of the Sun” —, was the most important link and a busy thoroughfare between Florence and Bologna; now, utterly abandoned by heavy traffic, it is a relatively quiet road along which it is a pleasure to drive (if you don’t mind the bends, that is! ); it also affords easy access to all the main sights of this mountainous region stretching between Florence and Bologna, which has remained surprisingly little frequented, and offers several occasions for immersion into a still relatively untamed nature. In fact, here paths stretch in solitude for miles on end: this can easily turn a walking or hiking experience into a rather solitary affair, and it can be equally rewarding — something you would hardly expect to find at such a short distance from two major cities. During WW2, the pass was defended by the defensive line known as ‘Linea Gotica’ (literally, the “Gothic Line”). 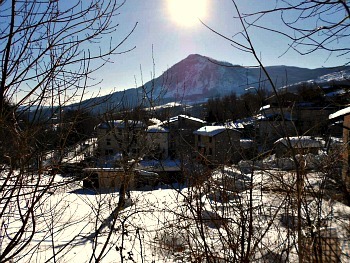 The surrounding hilly area features several peaks including Colla di Canda (901 m), Monte Canda (1,158 m), Monte Beni (1,259 m) and Monte Oggioli (1,290 m), where the source of the Idice river is also located. The Raticosa Pass is a well-known meeting point for cyclists and motorcyclists alike, riding along the winding “Futa Road”. Inside the fortress of nearby Firenzuola town center, is the “Museum of the Pietra Serena”, which details the quarrying and sculpting of this type of typically Tuscan sandstone, important in the development of the local community since the Middle Ages. Leaving the BO-FI (the long-distance trail connecting Bologna with Florence) that descends into Pietramala, the footpath ascends to Monte Canda and then continues along the Idice-Sillaro ridge, on the footsteps of the so-called “Flaminia Minor” — the historical Roman Road (187 BC) that connected Bologna with Arezzo (its exact track has been ascertained only for some sections; however, more information on this road can be found in the Northern Apennines page). Down to the right, rises the ophiolite rock spire known as Sasso di San Zanobi (described below). 1) Faggiotto — Boschetto — Sasso di Castro — Fontana dell’Amore — Fonte Ai Prati — Boschetto — Faggiotto; roundtrip; estimated time: 2,45 h.
2) Covigliaio/Piana — Pianore — Monte Beni — Covigliaio; estimated time: 2 h.
3) Mazzetta — Poggio Turchino — Monte Freddi — Fonte ai Prati — Pianore — Fabbrica — Mazzetta; roundtrip; estimated time: 2,40 h.
4) Covigliaio chiesa (church) — Fonte ai Prati — Pianore — Covigliaio/Piana; estimated time: 1,45 h.
The “Alta Via dei Parchi” long-distance trail takes in all the best the Apennine mountains can offer: from Berceto (near the Cisa Pass) to the cliffs of La Verna, sited in the Casentino region (from where, with a detour, one can also reach Monte Carpegna — in the Natural Regional Park of Sasso Simone and Simoncello), the path stretches out for about 500 km of ascents and descents, and it is divided into 27 stages, which connect two National Parks, one Inter-regional Park and five Regional Parks. The “Alta Via” allows a direct contact with the different environments that compose the varied Apennine landscape: glacial cirques, lakes surrounded by the splendor of high altitude grasslands, endless forests and clear streams, volcanic rocks ('ophiolites', see below) and gypsum cliffs. All of these can be experienced in serenity at a walking pace. Tour the Mugello Apennines by bike, following the itineraries of the “Distretto Cicloturistico Mugello by Bike”. The “Distretto Cicloturistico del Mugello” (Mugello Cycling District) is a network of tours and itineraries consisting entirely of paved roads, for explorer-cyclists, eco-tourists, nature lovers and bike racers alike. It allows you to tour the Mugello area by bike, supported by an integrated information system, and to experience first-hand the great cycling tradition of this hilly region. You can obtain the Mugello Cycle License and the Climber’s License by recording your performance on the journey — as well as your “racing speeds” — on the timed climbs, with the cycle tourist card. You can also consult the website www.mugelloinbike.it, from home or on your smartphone, for all technical support and tourist information. Plus, too, you can discover the integrated system of special services for your journey, and find the nearest facilities offering full assistance. The ophiolitic rocks (also more simply known as ophiolites) are an eerie sight, and one of the many natural treasures in the Apennines of Emilia-Romagna at large, and of the Bologna Apennines in particular. Relatively rare within the region, the ophiolitic outcrops – fascinatingly rich, for their harsh beauty – vary from blocks of small dimensions to rock bodies of kilometric extension, with widths of – sometimes – hundreds of meters. In the Emilia-Romagna, the ophiolites are particularly concentrated near the boundary with Liguria and, further east, with Tuscany – the area we are dealing with here. In these sections of the Apennines there are a number of geological features, which surface in natural cross-sections, and that take on a noteworthy scientific, naturalistic and environmental interest – so that they can in fact be classified as ‘cultural heritage’; among these geological features, the ophiolitic rocks are no doubt the first item on the list, and still awaiting proper valorization. The ophiolites always constitute elements that strongly characterize the landscape: their black-green colour, sometimes red-brown; the dour outline of the relief (derived from the major resistance of erosion in respect to the surrounding rocks – usually of a clayey nature); the scarcity (or absence) of tree cover and the impossibility to be exploited as agricultural land: all these elements concur to easily identify the ophiolites in respect to the other rocks that compose the Northern Appennines. This site is characterised by the presence of calcareous hills or mountains (such as Monte Canda (1,158 m), Monte Oggioli (1,290 m) and ophiolites (such as the Rocca di Cavrenno, pictured above, Sasso di San Zanobi, Sasso della Mantesca and Monte Beni, 1,259 m) – all emerging from a context with a strong connotation as traditional montane agro-pastoral landscape. This mountainous agricultural setting is partly affected by fast processes of abandonment and re-colonization by shrubs and trees that have originated a landscape very much like a mosaic, constituted by secondary pastured meadows, modest cultivated patches, shrubberies and woodland thickets on permanent meadows and on abandoned cultivated land, broadleaved woodland (mainly formed by oak and beech) and characteristic formations typical of the rocky crags, which often constitute geo-morphologic notable features. Among the most interesting habitats, one should at least mention the meadows on abandoned pastures on neuter-basic substrate and the meager meadows used for hay-making until the low altitudes – two habitats of regional interest, the first of which is also classified as a priority at European level. To be highlighted is also the sporadic presence of a flora typical of the ophiolite outcrops, with relic woodlands on the north-facing slopes. This site is a fundamental part of one of the main stations in the area (at regional level) for various threatened bird populations, connected with the presence of secondary meadows and pasture lands, in regression at the moment or with an unknown trend. Among the species of major interest and deserving protection to be seen here are to be mentioned Short-toed Snake Eagle (Circaetus gallicus; ‘biancone’ in Italian) – nesting irregularly in the area – and Ortolan Bunting (Emberiza hortulana; ‘ortolano’ in Italian), present with one of its major Tuscan stations. There are also important populations of amphibians, connected with the permanence of an articulated system of temporary pools of drinking water for the livestock (in the picture below, a view of the ophiolitic outcrop of Monte Beni, again as seen from the village of Pietramala). The Sasso di San Zanobi (or San Zenobi) is a rock formation in the Tosco-romagnolo section of the Northern Apennines. It is situated in the small valley of the Diaterna stream, a short distance away from the Passo della Raticosa, in locality Caburaccia (municipality of Firenzuola). In this place there was also a small church (dedicated to San Zanobi), found in documents since 1299, but unfortunately it was destroyed during the war (the WW2 front passed very close to here). The Sasso di San Zanobi is an ophiolite (a term derived from the Greek and composed of two words: ofis-, snake, and -lithos, rock – so 'snake-rock', because of the green and purple veins that run across it); it rises near the place where the church used to be, and where during the middle ages the Ubaldini family owned a castle. 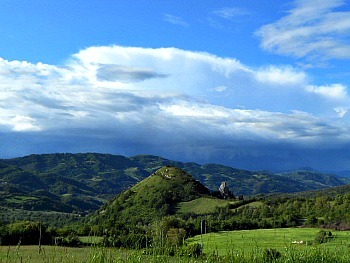 In this area are also found two other small mountains composed of iron, which have no affinity with the surrounding clayey landscape (the Sasso della Mantesca and the Rocca di Cavrenno, already mentioned above). During the 4th century, the Bishop of Milan, St. Ambrose, met with the Bishop of Florence (San Zanobi) near Pietramala. Apparently, after this meeting there was an increase in conversions in the area between the Diaterna and the Idice valleys; according to legend, at that point the devil summoned a counsel in order to find a way to stop the conversions from happening, and proposed San Zanobi a bid: whoever lifted the largest boulder from the Idice riverbed and managed to bring it to the top of the hill would be the winner, and would ‘take’ all the souls in the area. San Zanobi accepted the bid; the devil therefore picked up a boulder, and with a lot of effort brought it uphill with him. San Zanobi then picked up a bigger boulder and lifted it easily, keeping it on his little finger and – taking over the devil – he deposited it in the location where it still is today. 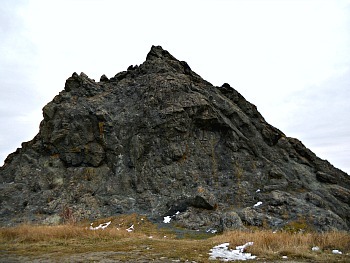 The devil, at that point – noticing he was losing the bid – became furious and hurled his boulder, which smashed into many small pieces and burst into fire: this is the Sasso della Mantesca, which is situated a short distance away from the Sasso di San Zanobi (pictured below), in the nearby Sillaro valley – another splinter, according to legend.